Samsung Galaxy S9 has a 3000mAh battery that supports wireless charging. The Galaxy S9 boasts a rear camera with a revolutionary dual-aperture design.The Samsung Galaxy S9 features a 64GB ROM for storage, and the internal storage capacity can be expanded up to 400GB via the microSD slot. Take photos without thinking twice when you have the Samsung Galaxy S9. The 12MP rear camera features two f-stop modes and a category-defining dual aperture design that adapts to bright light and super dim light automatically, just like the human eye. With the f/1.5 aperture mode, you can capture your nighttime adventures with stunning clarity. The rear camera has multi-frame noise reduction, so every photo you click in the dark comes out clear and bright, without any fine-tuning. The Samsung Galaxy S9 boasts of a super slow-mo mode that records videos at 960 frames per second. Messaging comes alive on the Samsung Galaxy S9. It lets you create an animated version of yourself to show off the inner you. Then you can add a personal touch to your message with the emoji, which detects and mimics your movements. 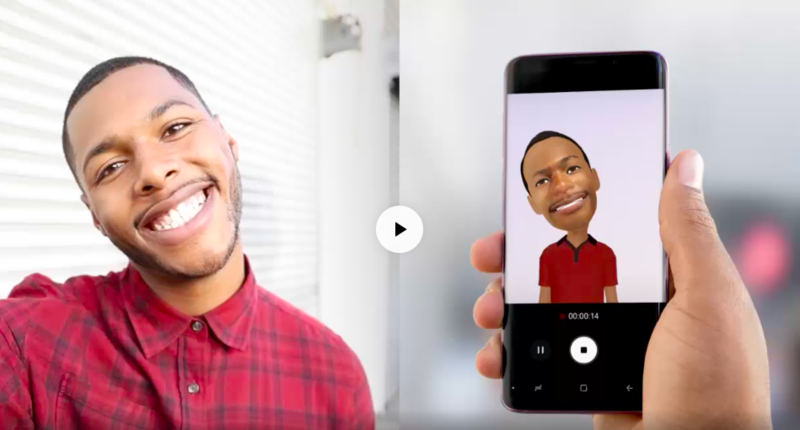 The AR emojis let you strut your personal style with customization options ranging from clothes to hairstyles. The animated AR emojis lets you put your emotion in motion. You can record videos with the emoji talking, singing, or whatever you feel like doing. Sometimes words can’t express your wide range of emotions. With the Samsung Galaxy S9, expressing your feelings on chat is not a problem as it features 18 AR emoji stickers. Add a human touch to messaging with your very own expressive emojis. The Galaxy S9 opens up your view with its grand, edge-to-edge, 5.8-inch display. The S9 with its near bezel-less design fits comfortably in your hand despite its large size. It has curves on the sides that provide a sight that is boundless with minimal visual distractions of the bezel. The screen has an 18.5:9 aspect ratio that gives you a cinematic view. It features Advanced Contrast Enhancement that lets you view photos as they were meant to be seen. The Samsung Galaxy S9 features a Samsung exynos 9810 Octa-Core processor and 4GB RAM. It lets you switch apps and multitask in a snap. Get your game on, watch videos, or text while you stream videos; whatever you do, the S9 performs quickly and fluidly. Moreover, with LTE speeds up to 1.2Gbps, the Galaxy S9 lets you download swiftly and stream instantly. The S9 has an incredible storage capacity of 64GB. It even includes an expandable microSD slot that supports cards up to 400GB. It also lets you store your photos on Google Photos with unlimited storage. Lack of space? What’s that? Is what you will say when you have the Galaxy S9 in your pocket.